Ideal for strong, healthy and beautiful hair and provide a stimulating action on hair bulbs and help counteract hair loss. 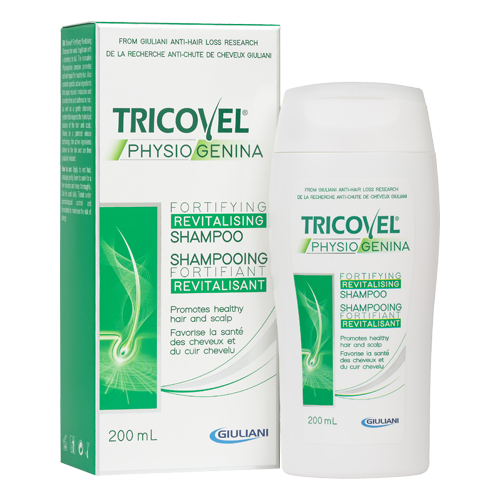 Tricovel® shampoo contains Biogenina®, the patented compound developed by Giuliani Anti-Hair Loss Research and selected active ingredients. Its precious wheat proteins repair the fiber of hair, giving it a special sheen and softness. Pro-vitamin B5 nourishes and hydrates hair, protecting it from chemical and styling stresses (hairdryers, brushes, etc). The new Triactive3 (micellar) technology enables Biogenina® to resist rinsing. - adheres to the hair shaft and to the scalp.